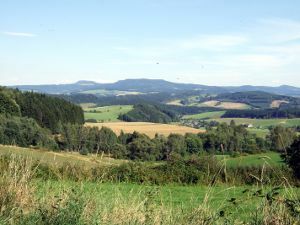 Bee farm Rokytník started its operation in 2003. Nowadays we have been keeping 155 tribe colonies of bees in multiple storey hives of type Langstroth placed on pallets. The pallet multiply storey system enables natural keeping of strong bee colonies. 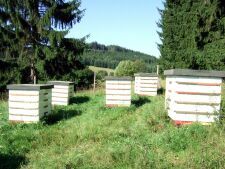 The bee colonies are placed mainly in forest locations 600 meters above sea level exclusively only on unique protected landscape area of Broumovsko (CHKO). 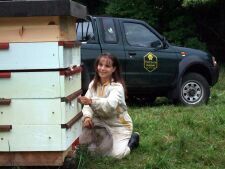 The main philosophy of our bee farm is specialisation on production of high quality honey from ecologically clear forests and meadows. We have been specialising in production of the following kinds of honey: forest, meadow, raspberry, maple, and lime and buckwheat honey. We use modern technologies and methods of natural keeping of bees. In keeping area it is the production of brood nuclei, artificial swarms and breed queens F1 from queen rearing. 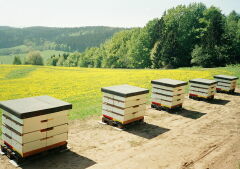 We send the queens from our queen rearing to beekeepers all around the Czech Republic. We cooperate in research and breeding programmes with the Bee Research Institute at Dol. Our effort is also to help small beekeepers and to promote beekeeping. We satisfy more and more customers by our delicious kinds of honey. We adjust our work according to their quality demand to fulfil in this way extraordinary requirements both in the market network and direct sale in our bee farm to tourists. Continuously increasing amount of our delicious honey customers represents a big motivation for our future. Ecology, highly valuable bee products and cooperation based on mutual trust with our customers is for us a guarantee that we are keeping the right way to create a modern, perspective and life-valuable activity.